Apple’s new ‘spaceship’ campus is set to debut in early 2017, but the company is showing off one impressive piece of the puzzle (literally) early. 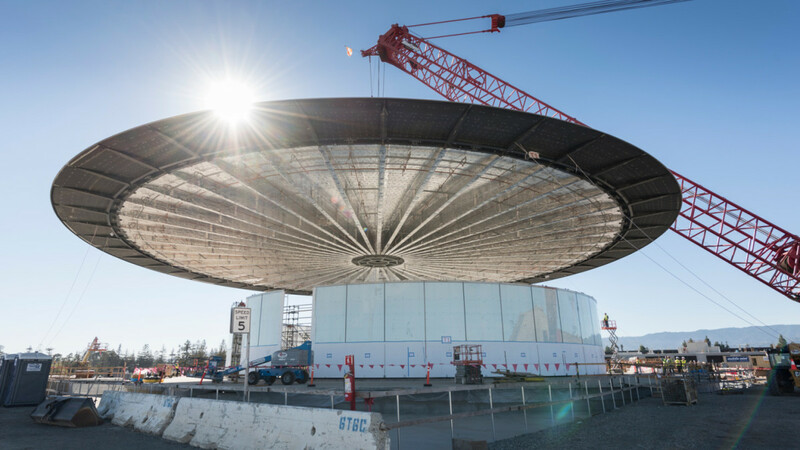 The roof of Apple’s new “Theatre” is a one-piece, 80-ton behemoth that is 140 feet in diameter. It’s also made of carbon fiber, and Apple believes it’s the largest freestanding piece of its kind. Made up of 44 identical radial panels that average 70 feet long and 11 feet wide, the roof was fully assembled in Dubai before being shipped to Cupertino. The Theatre’s roof will sit over a foyer of sorts; the actual 1,000 person seating area will be underground, but the above-ground portion is where Apple will show off new products and check in event attendees.